RePub, Erasmus University Repository: Choosing between Higher and Lower Resolution Microarrays: do Pregnant Women Have Sufficient Knowledge to Make Informed Choices Consistent with their Attitude? 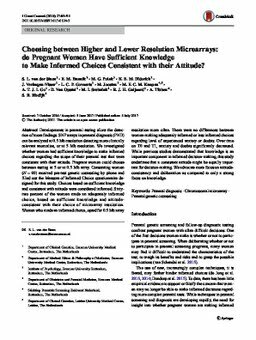 Choosing between Higher and Lower Resolution Microarrays: do Pregnant Women Have Sufficient Knowledge to Make Informed Choices Consistent with their Attitude? Developments in prenatal testing allow the detection of more findings. SNP arrays in prenatal diagnosis (PND) can be analyzed at 0.5 Mb resolution detecting more clinically relevant anomalies, or at 5 Mb resolution. We investigated whether women had sufficient knowledge to make informed choices regarding the scope of their prenatal test that were consistent with their attitude. Pregnant women could choose between testing at 5 or at 0.5 Mb array. Consenting women (N = 69) received pre-test genetic counseling by phone and filled out the Measure of Informed Choice questionnaire designed for this study. Choices based on sufficient knowledge and consistent with attitude were considered informed. Sixty-two percent of the women made an adequately informed choice, based on sufficient knowledge and attitude-consistent with their choice of microarray resolution. Women who made an informed choice, opted for 0.5 Mb array resolution more often. There were no differences between women making adequately informed or less informed choices regarding level of experienced anxiety or doubts. Over time on T0 and T1, anxiety and doubts significantly decreased. While previous studies demonstrated that knowledge is an important component in informed decision-making, this study underlines that a consistent attitude might be equally important for decision-making. We advocate more focus on attitude-consistency and deliberation as compared to only a strong focus on knowledge.